The Impact pad with hexpad technology is integrated into a new low profile, form-fitting knee or elbow pad. Perfect for all levels of impact absorption. The #6440 HexForce Knee or Elbow Pad is one of McDavid’s most popular and versatile pads, featuring proprietary HexPad material in a versatile, lightweight, protective pad for the knee or elbow. Individual hex shaped pads conform to and move with your body for solid comfort and continuous protection, while compression fabric holds the pad firmly in place and keeps muscles warm to prevent pulls and fatigue. HydraVent hDc Moisture Management Technology keeps you cool and dry, as well. (1) This material results from a patented process that permanently bonds hydrophilic (water-attracting) molecules to mid-weight and heavyweight synthetic fiber surfaces, ensuring HydraVent hDc remains intact even after numerous washings. (2) As you exercise, your body produces perspiration to cool itself and this perspiration condenses on your skin and builds up heat and discomfort. (3) Moisture is pulled away from the skin by the wicking ability of HydraVent hDc, so your skin remains cooler and drier, and your body’s temperature management system can do its job more effectively. 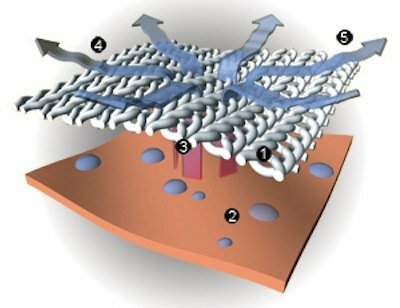 (4) Once the fabric absorbs the moisture, it is spread rapidly across a broader surface area for faster evaporation, and this evaporation draws heat out of the body. (5) Finally, when moisture is one molecule thick, HydraVent hDc starts its drying process, allowing for a consistent and rapid moisture transport ability over a long use time. Hexpad Technology is a patented padding system that permanently bonds dozens of individual athletic pads into fabrics. Because the pads are individually applied, they move with and conform to the body for continuous protection that isn’t bulky or restricting. The material is machine washable.